Now more than ever, those acting to deconstruct these oppressive systems rely on critical and new perspectives, new insight, community-based solutions, creative opportunities, and complex ways of thinking about the future of education. This journal aims to be a venue where this knowledge is shared. As such, the journal is unique in itself, and even furthermore is the only one seeking to interrogate higher education and student affairs solely through the utilization of critical social theories, perspectives, and frameworks. The journal process and content works to deconstruct systems of power within the publishing world and academia. Through open-access copyrights and open-review processes, we seek to problematize and dismantle the ownership of knowledge. JCSHESA adheres to the BOAI definition of open access and users have the right to read, download, copy, distribute, print, search, or link to the full texts of these articles. We welcome submissions across a range of topics that interrogate higher education and student affairs through the explicit use of critical social theories and frameworks. Please read through our submission guidelines for more information. If you have additional questions, visit our editorial board page to email an editor. 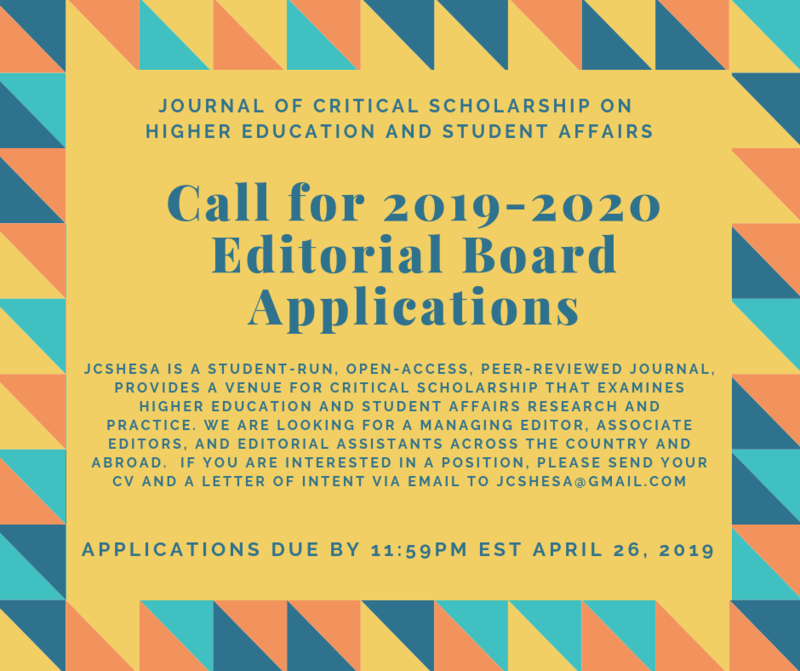 The Journal of Critical Scholarship on Higher Education and Student Affairs (JCSHESA) is seeking graduate students interested in joining the Editorial Board for the upcoming 2019-2020 academic year. We are looking for Associate Editors (4), Editorial Assistants (8), and a Managing Editor positions. All available positions are open to graduate students around the country. Associate Editors are collectively responsible for serving as liaisons with reviewers, outreach, and coordination of the journal. If you are interested in a position, please send us a letter of intent and a CV indicating your interest. The full call and position descriptions can be found here. Materials should be submitted to jcshesa@gmail.com by April 26, 2019. Have you considered submitting a conference proposal for an academic conference as a Higher Education graduate student? 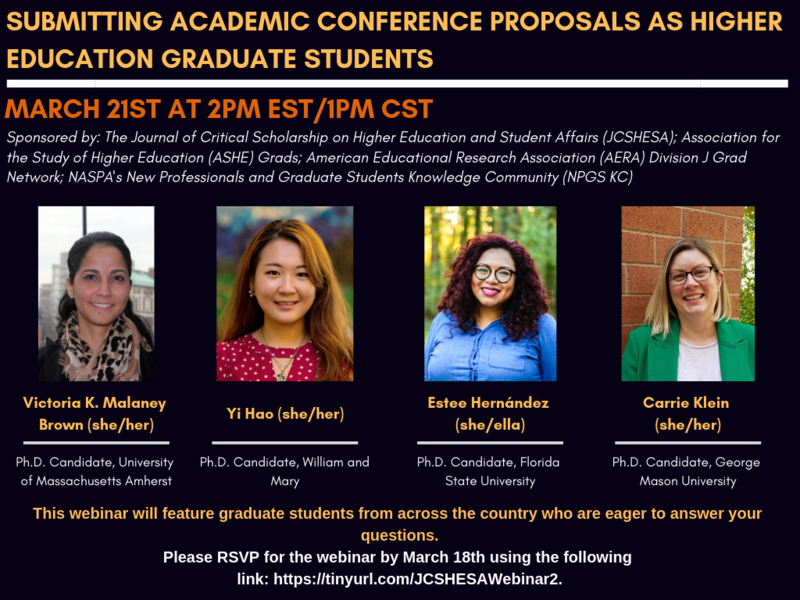 Whether you are currently working on a proposal or thinking about it for the first time, join us for a webinar discussion and hear from other graduate students about the submission process. Learn about presentation formats, conference types, writing an effective proposal, and more! 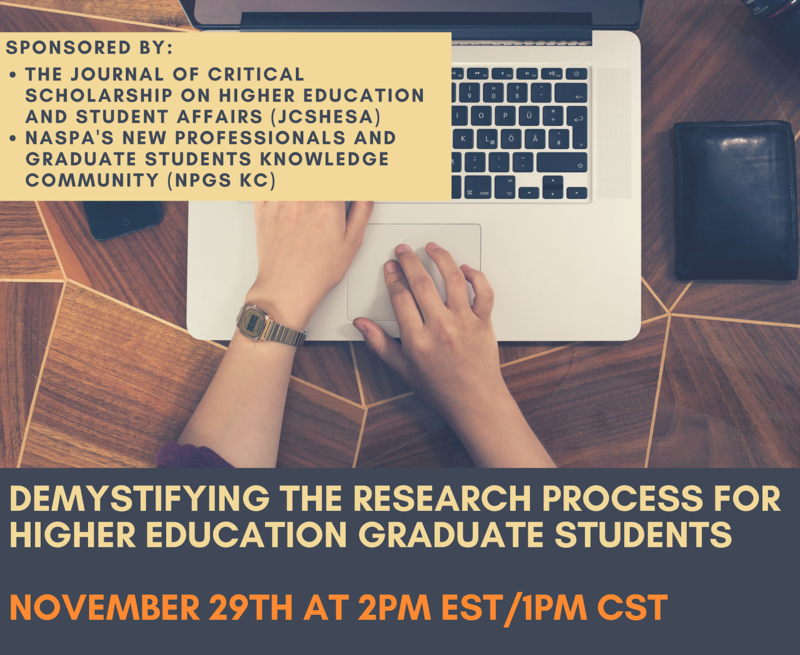 This webinar was co-sponsored by the Journal of Critical Scholarship on Higher Education and Student Affairs (JCSHESA) and NASPA's New Professionals and Graduate Students Knowledge Community (NPGS KC) . and featured graduate student panelists that spoke about demystifying the research process for higher education graduate students. Attendees also took the opportunity to ask questions for the panelists to answer. A copy of the webinar can be found here on our YouTube page. We are excited to be attending the annual conference for the Association for the Study of Higher Education (ASHE) in Tampa, FL. 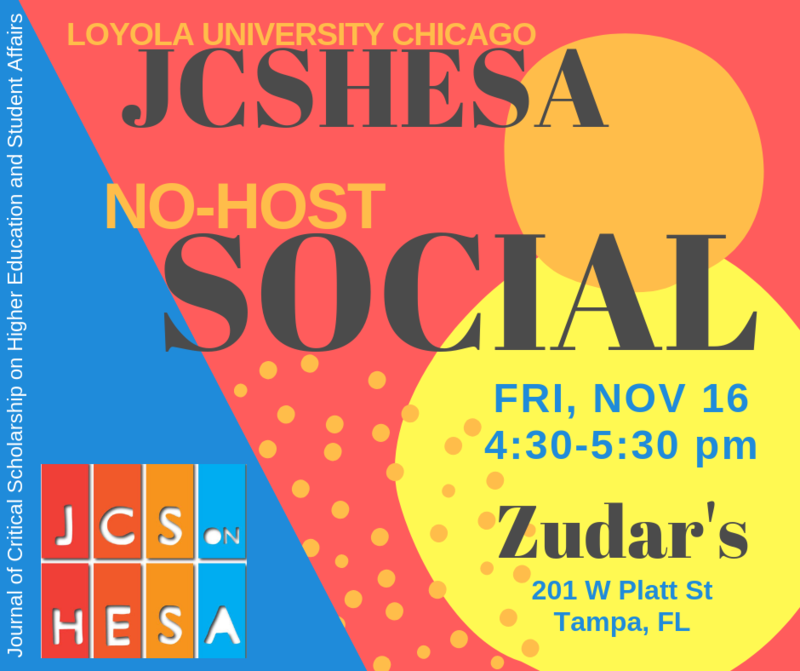 Each year, we offer an opportunity for scholars, faculty members, and graduate students of higher education to come together for a No-Host Social. Our hope for this social is for everyone to come together to build community in academia, engage in critical dialogue about scholarship, and learn more about the Journal if you are interested! We will be meeting at Zudar's (201 W Platt St.), a bar that is nearby to the conference hotels. If you have questions or want to know more about our Journal prior to the event, please email us at jcshesa@gmail.com. Look forward to seeing you there! 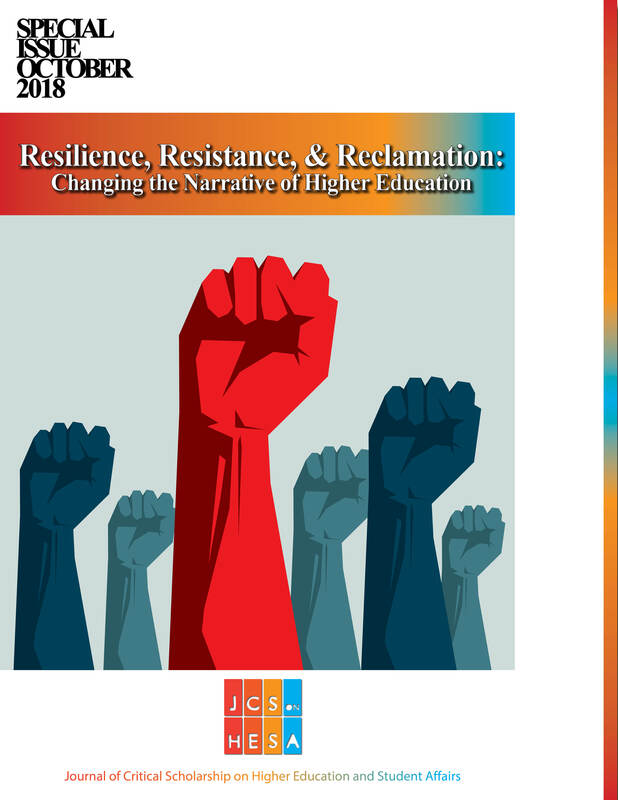 It is with great excitement that we release our latest special issue, Resilience, Resistance, and Reclamation in Higher Education. We were fortunate to include multiple studies, narratives, and experiences with the help of amazing scholars, artists, and practitioners seeking critical change in higher education and student affairs. Special thank you to the editors and reviewers of the 2017-2018 Editorial Board for helping make this issue possible! We hope this issue inspires your work and research and look forward to more publications to come soon! JCSHESA is housed at Loyola University Chicago in the School of Education's Higher Education program.